Nestled in the pine-covered foothills of the Sierra Nevada range sits the city of Nevada City, California. This community—located approximately 60 miles northeast of Sacramento—often faces the threat of wildfire year after year. It is often dry, warm, and windy from spring through late autumn. These conditions are prime for wildfire activity. This community is looking at a unique way to help reduce the wildfire threat. Unfortunately, the last few years have not been kind to California. Some of the largest, most destructive, and deadliest wildfires in state history have occurred since 2017. The Thomas Fire in December 2017 burned over 280,000 acres and subsequent mudslides led to nearly two dozen deaths. The Mendocino Complex Fire—at nearly 460,000 acres—became the state’s largest wildfire in July 2018. Sadly, the Camp Fire in November 2018 caused the deaths of 86 residents in Butte County and is the state’s deadliest wildfire. 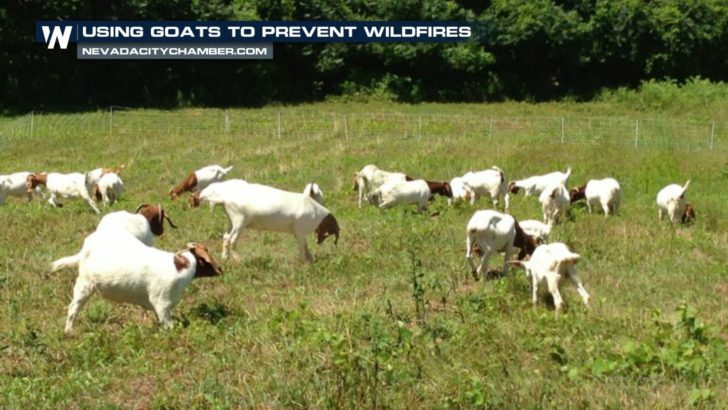 With the very real threat of wildfire, the community of Nevada City is turning to goats—that’s right, goats—to help prevent such destruction. Through prescriptive grazing, goats can actually help reduce the wildfire threat. Prescriptive grazing is defined as a naturally-controlled harvest of vegetation using animals. It is planned and managed with the intent to achieve specific goals on the land, such as wildfire fuels reduction. Nevada City is looking to utilize goats to graze on over 450 acres of publicly-owned park and wild land this winter. According to the city, “Our local ranchers have already rented out their herds next spring, summer, and fall. And while the ranchers are expanding to meet demand, for now, they are only available to Nevada City on a large scale THIS winter. THIS is why time is of the essence.” While the city is looking into securing funding through grants, that process often takes many months. For this reason, the city set up a Go Fund Me account online known as Goat Fund Me.